Travelers to Morocco will find an amazing array of culinary delights to tempt their palate, with traditional foods ranging from ultra-simple fare, such as homemade Moroccan bread dipped in organic olive oil, to impressive fusions of ingredients and flavors like those found in couscous and tagine preparations. While many business travelers and tourists are satisfied with sampling such foods as they go, know that you can plan a food-focused culinary tour to Morocco or at least try to seek out traditional Moroccan cooking classes while there. Of course, you can't board a plane with a hot tagine or couscous preparation, but what exactly can you bring home from Morocco in the way of food products? It's always best to check custom laws in your destination or home country, but in general dried, preserved, and cooked foods are fine to pack in checked luggage. The following slides show what many Moroccans themselves choose to bring out of the country when traveling abroad. Be sure to wrap all food products well and label the exterior so that customs officials know what's inside. Also, remember to declare all food products on any customs documents that you're asked to fill out. Sweet things first! When boarding a flight out of Morocco, you'll always see travelers hand-carrying cookies still wrapped in bakery boxes. It's the best way to ensure that traditional sweets such as kaab el ghazal, chebakia, and peanut slippers arrive intact, but if you do want to pack them in your luggage, many stores sell inexpensive plastic storage containers which will help to protect fragile sweets from being crushed or tossed around. Be sure to pack the containers well, stuffing in parchment paper or other fillers to keep cookies packed snugly in place for their flight home. Why bring cookies home? Well, many of us like to give them as gifts, and Moroccan family abroad are grateful to receive sweets from their homeland. One of Morocco's most treasured products is argan, a light, nutty oil extracted from the kernels of the argan tree. This exquisite culinary oil is not only delicious on its own—just dip in with a piece of crusty bread—but also cosmetic grade and thus highly celebrated as a beauty product. Argan oil outside of Morocco is quite expensive, so it makes sense to bring some back with you for personal use or as a gift. You'll want to secure the lid of any oil you pack in your luggage (you can do this with tape) and then wrap the bottle tightly in plastic. During your travels in Morocco, you likely will have the opportunity to sample amlou, a deliciously addictive spread made from argan oil, almonds, and honey. It does add weight to your suitcase and as a delicacy, it doesn't come cheap, but you may very well find the splurge to be well worth it. Be sure to tape the lid shut on the jar, and then wrap the whole container tightly in plastic wrap or a plastic bag. Alternatively, use some of the argan oil you're bringing home and make your own amlou; it's probably much easier than you think! This gourmet spice grows in the Taliouine region of Morocco, where it's cultivated for export and domestic use. Famous as the most expensive spice in the world due to the labor-intensive process of harvesting it, saffron is regarded as an essential ingredient in Moroccan cuisine and is used in many other cuisines as well. You'll likely find it quite affordable in Morocco as compared to supermarket prices back home, so be sure to take advantage and stock up. The name of this famous Moroccan spice blend translates to "the head of the shop" because it's the best product a Moroccan spice vendor has to offer. It's a complex mix of spices that varies from shop to shop, so you might want to buy small amounts from several shops to compare. The sky's the limit when it comes to uses, but researching Moroccan recipes with ras el hanout will give you some ideas of how to add it to your cooking. If you're not traveling to Morocco, you may want to try to make it. Or you can purchase ras el hanout online. Saffron and ras el hanout aren't the only spices to stock up on, of course; Moroccan cuisine makes use of a number of other spices and herbs such as ginger, paprika, cumin, turmeric, anise seed, cinnamon, fenugreek and more. All will tempt you at the Moroccan spice market, and you'll find them much more affordable and in larger quantities than what you're used to getting in a Western supermarket. Ziplock bags will help lock in flavor and freshness, but especially fragrant spices such as anise and licorice should be in their own packaging; that's because strong flavors can leach into other foods, particularly other ground spices. Sure, you can buy olives and harissa (a fiery chili pepper condiment) outside of Morocco, but nothing beats the flavors and prices of these preserved foods in their country of origin. Olives are immensely popular throughout Morocco, both for eating and as a condiment in cooked dishes, breads, and salads. After you sample some of the many varieties available (olives in chermoula and olives in harissa are just two of them), you'll be wanting to bring them home for yourself and others. Wrap drained olives tightly in several layers of plastic bags (ziplock bags also work well) and they'll be fine tucked into a suitcase. Placing the wrapped olives in a plastic storage container will add an extra layer of protection and help avoid food odors in your packed clothes. No need to worry about lack of refrigeration for several days or more; they're a preserved food and are sold in open-air markets with no risk of spoiling. But do refrigerate them once you get home. Preserved lemons provide key flavor to many Moroccan dishes. While they're easy to make at home, they will need to sit undisturbed for a month or longer before they can be used. Nothing then beats the convenience of picking up some that are already ideal for cooking. For especially pungent and tangy flavor, look for soft, aged preserved lemons like those shown in the photo here. They will likely be handed over to you in a flimsy plastic bag; simply secure within another bag or two or stick them in a plastic jar or container. Like olives, they will be fine without refrigeration until you get home. 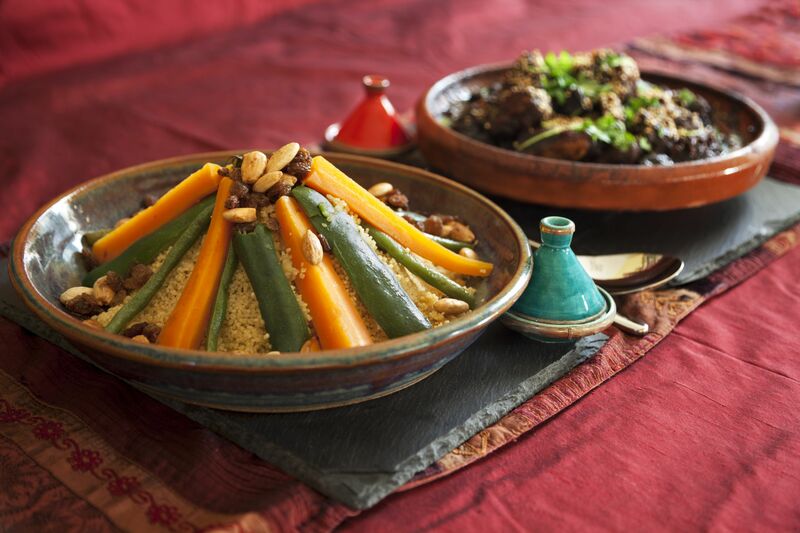 Khlii (or khlea) is seasoned Moroccan preserved meat which is packed in olive oil and fat. If you're already a jerky lover, chances are you'll be swooning over such homey Moroccan fare as khlea and eggs or khlea and lentils. Look for beef khlea as opposed to lamb, as the latter can be very gamy or off-putting in flavor. Vendors in the old Fez medina are renowned for their khlii but you'll find it in other cities as well. It will be packed in a plastic container for you, but sure to add another layer of plastic bag or wrapping around it for extra protection. Smen is salted preserved butter. You'll see it unpleasantly described as rancid, stinky, and more, but in truth, this very pungent condiment adds a unique flavor to many traditional dishes. (And no, the final result is not unpleasant or off-putting in the least!) You'll want to try —and will probably enjoy—smen in ​couscous, harira, and rfissa. Know that a little goes a very long way, so just a teaspoon is often enough to do the trick. Nonetheless, some Moroccans eat it as a spread, but such die-hard traditionalists are now few and far between.